This image depicts Martin as a saint for he is protecting the citizens by informing them of the wrongful actions. The church official is dressed very fancy/wealthy while the others' attire is very poor. This shows that the church officials were commiting these actions for their benefit rather than that of the people. One includes the indulgences being sold for these are unsupportive of the church's ways and prove the teachings of the Bible rather than the teachings and influence of the higher-archy. 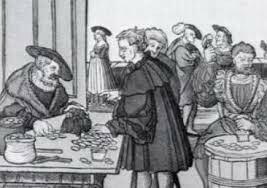 These indulgences were causing some to become very poor, yet they acted as the church wished for they beliieved this is what God wanted. However, Luther portays a saint in the fact that he utilized the teachings of the Bible to prove that the ways of the church is not the way of life that God intended for His people to live, for wealth and work do not buy forgiveness, only God can decide whether one is culpable. This image is one of a man that was influenced by the ideas of Luther. Luther was very influential to many which further lead to more improvements and advancements/new ideas in his religion. A specific example is John Calvin. He can relate to Luther's ideas for he was very similar. Like Luther, he translated a piece known as Institutes of the Catholic Religion into other languages. He believed that people are corrupt in comparison to the highly powerful God. He promoted the idea of predestination which was also expressed in Lutheranism. He created a new form of government, a theocratic state. Calvin also formed a church. In schools, he persuaded educators to inform their children of their role in society and as well as church life. This image depicts Luther's ideas and the final idea, the 95th one, is the most profound. Not only did Luther teach others to stand apart in this, but he also taught them to speak their beliefs no matter how frightened they are of the higher power. This is very similar to Plato's Allegory of the Cave for he defies the uniformity and breaks free from the rule. He is confident in what he believes in, like Antigone, from Sophocle's novel Antigone. She departs from the rulers and expresses her beliefs for she knows what God wants to become of her. Luther promotes his beliefs of God knowing that he may be punished by the people of today, he believes that he will obtain a good afterlife. In his 95 thesis, he states that Christians should overcome their problems rather than rely on the preachings of others. This means that if someone commits a wrong doing, they should right the wrong. This changes the way people think, for now, they rely on God's direct word rather than those of the church officials. They do not take the easy way out. By listening to the Catholic teachings one can not become self-reliant/independent and they remain living in a false life, one that is not worth living. Through this statement, Martin Luther conveys the people of God to trust him. If one thing in the church goes wrong, the citizens are so dependent on these teachings that they can no longer fend for themselves when the church finally becomes as corrupt as the popes. This image shows the seven sacraments. Luther accepted some of the sacraments, however, this is not what God intended. He wished for all seven of the sacraments to be fulfilled by the people. Luther went against these sacraments, and by doing so, he defiied the word of God along with the word of the church. He also influenced others, such as Calvin, to follow this belief and expand on the idea. The Church most likely favored this due to the fact that the citizens were gaining unsupportive views because of this disobedience of God. Therefore, the church attained many new arguements to contradict that of Luther's. By promoting the opposite of God's wish, Luther became a sinner in the eyes of many. This image of the Bible represents Luther's great apprectiation, yet it also shows his disbelief. Luther's religion was non-Christian. He promoted some of the ideas of God, but other times, he preached that Christ was not real. This defied that of God's words for he gave his only son to this world. It seems uncanny that Luther can follow the written Bible and sees it as the only truth, yet he does not believe in Christ who is the main topic of this significant book. His small action lead to the mass murdering of others. In this scene, because Luther promoted his ideas, the Protestant Reformation lead to the persecutions of those religions that were not quite as powerful. Also, wars resulted in copious amounts of deceased men. This yet again disobeys the words of God. In His Bible, the commadments state that thou shall't not kill. Eventhough Luther did not kill, he lead to a superfluous number of other murders. 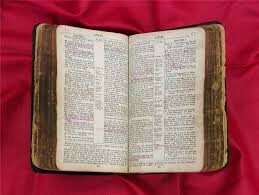 "Bible". Google Images. 22 December 2015. "Indulgences". Google Images. 22 December 2015. 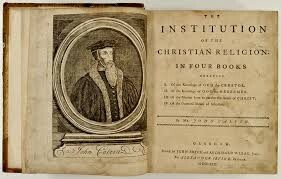 "Jean Calvin (1509-1564) The Institution of the Christian Religion". Google Images. 22 December 2015. 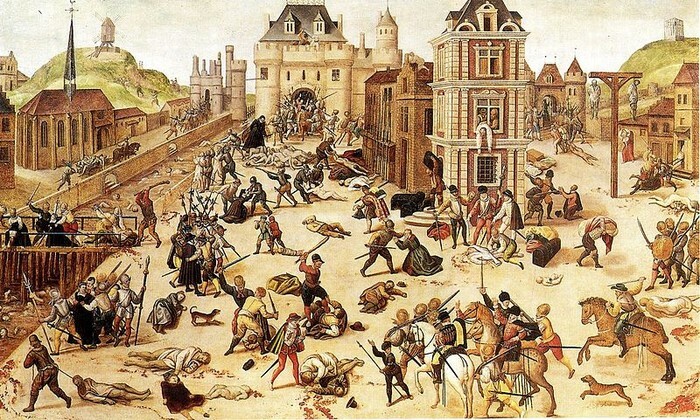 "Protestant Reformation: French Huguenots French Wars of Religion and The Edict of Nantes". Google Images. 22 December 2015. "95 Theses". Google Images. 22 December 2015. "The Seven Sacraments". Google Images. 22 December 2015.